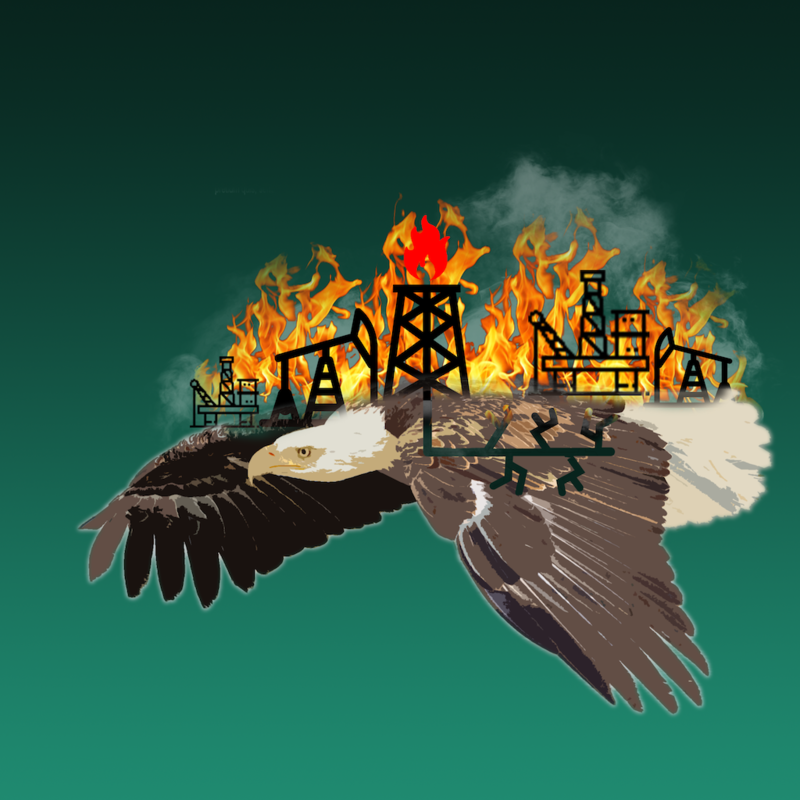 Standing alone in the Well of the Senate on Thursday night, just after 6pm and moments before the Senate adjourned for August recess, Alaska Senator Lisa Murkowski committed a deft coup d’etat on behalf of the oil and gas industry. The vote to confirm Neil Chatterjee and Robert Powelson to the Federal Energy Regulatory Commission was anything but un-controversial, and was a serious breach of regular order. 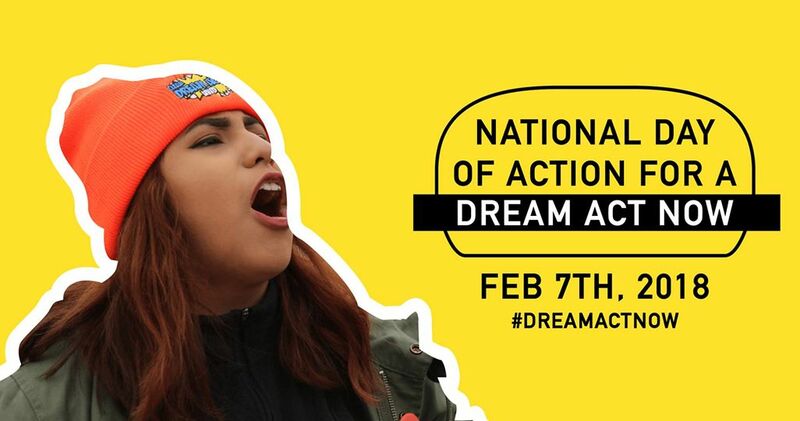 Just hours earlier, seven activists were arrested in front of Senator Chuck Schumer’s office. They had refused to leave until the Minority Leader spoke out about the dangers of FERC nominees and an energy bill that would dramatically expand FERC’s powers. 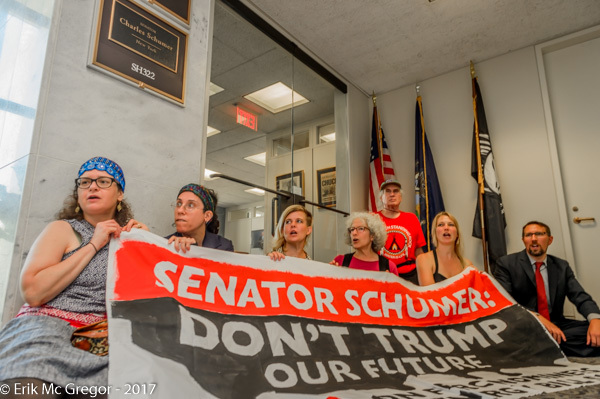 The activists, including several of Schumer’s constituents, had delivered a letter backed by more than 30,000 comments of support asking him to vote no on FERC nominees and no on the energy bill. Hours later, Schumer and every member of the Democratic Caucus, including 3 senators who had previously voted against the nominees in committee, stood silent as Murkowski rammed through the nominations on a voice vote with no other members present, no accountability, and no opportunity for citizens to call or contact their senators to voice concerns. For years, we’ve worked to expose and fight FERC’s corruption, the harms it inflicts on communities and the climate, its ties to the gas industry, and its arcane procedures that shut out the public and empower corporations. Senators like Schumer, Cardin, Warner, Whitehouse, Sanders, Hirono and Merkley have sympathized and offered statements of support. On Thursday night, August 3rd, when it actually mattered, they stood aside and let violence be done on our communities. As we warned Senator Schumer, they must now expect our growing rebellion. We cannot forgive and will not forget this utter betrayal, and pledge outright resistance in every way we can peacefully muster it to stop FERC from meeting, rubber stamping permits and engaging in further communicide. These arrests happened only hours after Trump officially nominated Democrat Richard Glick, an energy aid to Senator Maria Cantwell, to FERC. Richard Glick will now have to pass through the Senate Committee on Energy and Natural Resources before coming up for a confirmation vote by the full Senate. Republican FERC nominees Neil Chatterjee and Robert Powelson have already made it through the committee and are up for a full Senate vote soon. Powelson and Chatterjee need to be approved before FERC has the quorum it needs to approve fossil fuel infrastructure projects. Senators on both sides of the aisle have shown little to no opposition to Trump’s FERC nominees. Because FERC has lacked a quorum since February, Bloomberg reports that $14 billion worth of infrastructure projects are being held up, worrying investors. This includes Dominion’s proposed $5.5 billion Atlantic Coast Pipeline, and the Nexus pipeline, a $2.1 billion joint project from DTE Energy Co. and an Enbridge subsidiary. Those opposed to Trump’s nominations to FERC point out FERC’s utter disregard for communities and the climate. FERC regulates the electricity market and is responsible for rubber stamping fossil fuel infrastructure such as fracked gas pipelines, compressor stations, and LNG export terminals. Climate protectors, individuals, and groups from around the country are demanding that the Senate reject Trump’s FERC nominees until FERC’s abuses of power and law are investigated, and steps are taken to replace FERC with an agency dedicated to a just transition off fossil fuels. The FERC Vacancies Campaign has been working for months to fight Trump’s FERC nominations. They have sponsored national lobby days, call-in days, district office visits, and disruptions to pressure senators into voting no on Trump’s nominees. They pledge that the resistance will continue to the end, and that there will be political consequences for Schumer and anyone else if they vote in FERC’s favor by approving either Trump’s FERC nominees or the upcoming energy bill.